I ordered this candle after there were people who threatened our relationship during this period of Mercury in retrograde. So far, things have died down. No new drama is good news! 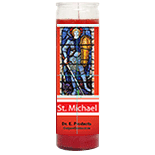 Now that the candle has burned and there was a good sign that my petition called forth St. Michael and his blessings, I can expect that we will be left alone to love each other in peace. Thank you Dr. E and his followers!